Place onions, mushrooms, soy sauce, and olive oil in a non-stick pan over a medium heat, stirring occasionally. Cook until the onions caramelize and the mushrooms soften and become a deeper brown - approximately 20 minutes. The volume of the onions and mushrooms will greatly reduce as they cook. While the mushrooms and onions are cooking, rub steak with garlic powder, salt, and pepper on both sides. Heat a frying pan over medium/high heat. Once pan is hot, place the steak on the pan for four minutes, then flip and cook for another three minutes. Depending on the thickness of the flank steak, this cooking method will produce a medium cooked steak. Once you remove the steak from the pan, let it sit for at least five minutes before cutting and eating. 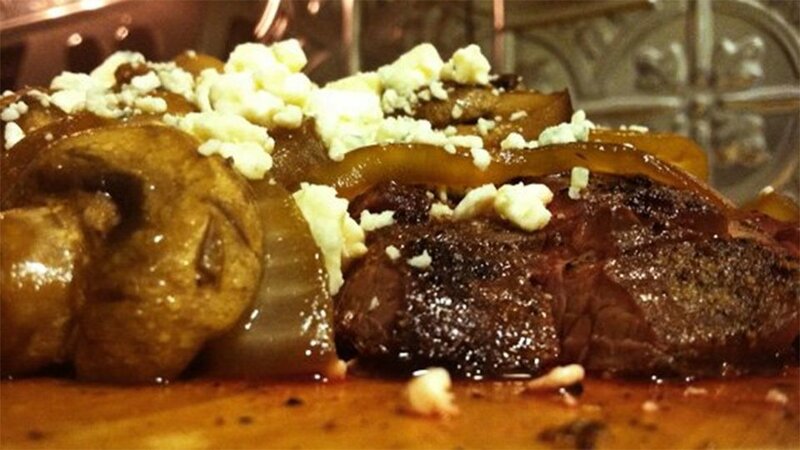 Finish the dish by pouring the onion/mushroom mixture over the steak and topping with blue cheese.